If you are one of the many RV travelers who loves taking your pets along for the ride, then you want to make sure your dog stays healthy on the road. Dogs who go camping regularly can get sick from local water sources, gain weight from licking too many plates, and fall victim to fleas and ticks. 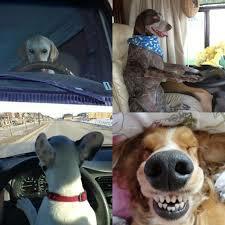 Keep your dog safe on the road and at the campground with these easy tips. Skunks and other mammals carry distemper, and your dog just has to walk through an area where an infected animal has urinated to contract it. This frightening disease is incredibly easy to contract, but the good news is that vaccines work wonders. Before heading out, make sure your pet is up to date on vaccinations for Lyme disease, distemper, rabies and parvo. Food particles cannot go down the drain in most campers, so you let your pet lick the bowl. While your dog may have mad skills when it comes to cleaning the plates, this habit is not good for her waistline. Put the scraps in the trashcan and feed your dog her regular food to avoid unnecessary weight gain. Dogs can fall victim to upset stomachs just like people can. Invest in an in-line filter for the camper, so your pet can enjoy filtered water and feel better. Some pets have sensitive stomachs, so you might want to feed them bottled water or bring water from home. Take your dog out for regular walks at the campground. It’s a good way to make friends, you’ll get some exercise and your pet will love taking in the sights and smells of the campground. Even if your pet normally listens to you and doesn’t need a leash, you should still have one on your dog for safety. An added bonus is that it will help keep your dog mentally stimulated, happy and socialized. Prevent dragging fleas and ticks home by avoiding densely wooded areas and fields with tall grass. Use pest repellants like Frontline or Advantage to stop fleas from making your pet their home. Check your dog for ticks after walks, and use the flat edge of a credit card to remove them. 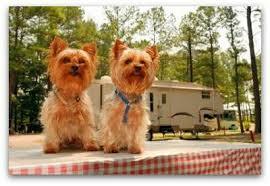 You love traveling with your furry companion, and your dog looks forward to going camping with you. In addition to considering your health, take your pet’s health and well-being into account. Keep your dog healthy by going on long walks, sticking to a regular diet and using filtered water. Visit the vet before you go to get any necessary shots, and avoid pests like fleas by using flea repellant and avoiding heavily wooded areas.